This golfed cart-sized, cheetah-mottled pram could be bad reports for those guys who make a living driving up and down the fence position of Podunk facilities around the country while drinking bad russet. The Guardium UGV employs grandeur-of-the-art technologies and any number of payloads to guard chairs like airports, energy plants and martial bases-24/7, downpour or shine and lacking the penury for 7-11 pit stops. 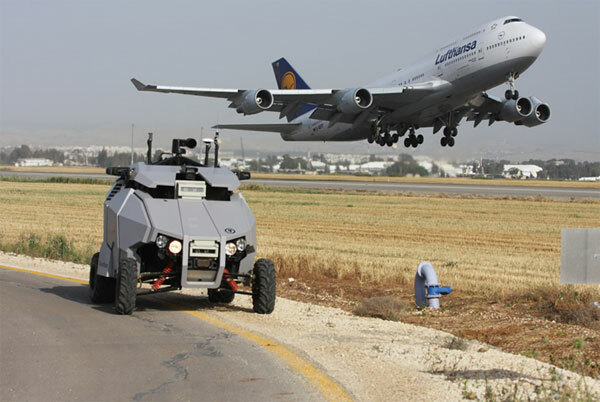 A shared venture between G-NUIS Unmanned Ground Systems, Israel Aerospace Industries (IAI) and Elbit Systems Ltd. the Guardium is an the territory vehicle that takes precision of itself. It uses autonomous resolve-making and persistent navigation to overcome deficient GPS conditions, treaty with obstacles and other variables as well as to plot and replan routes in very time. Weather impervious panoramic artificial imaging, videotape compression, records fusion and wireless commo make this one forward little SOB. While this UGV was planned for routine missions, such as programmed patrols along an outskirts and other guarantee routines, it can also react to “unscheduled trial.” It can also be worn for combat encourage. This entry was posted on Wednesday, August 13th, 2008 at 2:47 pm and is filed under military robots, robot news, robots. You can follow any responses to this entry through the RSS 2.0 feed. You can leave a response, or trackback from your own site. Hmm… the top part certainly looks menacing. But not sure what’s the deal with the whole wheel structure — with tie-rods showing and everything! I’d imagine that to be the most vulnerable part if Gardium happens to meet with people with more than mischief on their minds!